Radu Lupu, who is considered by most pianophiles as one of today's greatest artists, receives a CBE in the New Year Honours List. I'm afraid it is simply not recognition enough for an artist of his calibre. Meanwhile, in Canada another great pianist, Angela Hewitt, has been made a Companion of the Order of Canada - the highest honour that the country can give one of its citizens. The pianist Malcolm Martineau and the conductor Steuart Bedford all receive OBEs, along with singer-songwriter Damon Albarn, former head of the ABRSM Leslie East and music publisher Paulette Long. The founders and artistic directors of Music Theatre Wales, Michael McCarthy and Michael Rafferty, and Jeremy Wilding, chairman of the Three Choirs Festival Society, all receive MBEs. So does the violinist Alina Ibragimova, as well as the CBSO violinist Catherine Arlidge, who has spearheaded numerous initiatives to engage children with music. In ballet, this year's list includes a knighthood for choreographer and New Adventures director Matthew Bourne, a CBE for Tamara Rojo, head of English National Ballet, and an OBE for choreographer Christopher Wheeldon. 10. Tasmin Little's speech to the All-Party Parliamentary Group for Music Education. 8. Anna Rezniak saves the day for Lars Vogt and Christian Tetzlaff: page-turner video goes viral. 7. Birmingham Music Library is under threat. 5. Farewell to Jack McCaw, wonderful clarinettist (and wonderful neighbour). 3. 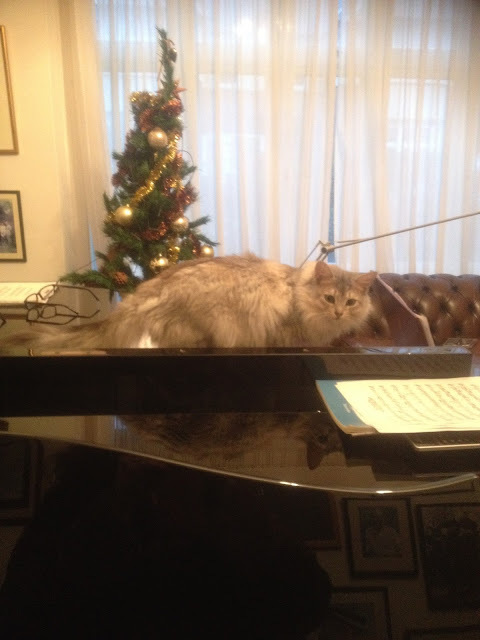 Pianist lands dream job. Namely, Piers Lane is assuming the directorship of the Sydney International Piano Competition. 2. Sarah Connolly's speech on why we need the arts, as presented to a special Arts Council England event in Westminster. 1. Barenboim is involved in designing his own bespoke piano and plays it in London. Meanwhile, I'm glad to say that the 2013 post Fanfare for the Uncommon Woman Conductor remains hot property and has notched up more reads than any other post in more than 12 years of JDCMB existence. "Two steps forward and one step back - is this forever our future?" Do have a listen to this interesting conversation, from the BBC World Service's Newsday, between conductor Odaline de la Martinez and composer Nicola LeFanu about the changing - ? - situation of women in their professions. One problem they raise is something that is increasingly being recognised: prejudice is not something conscious. They discuss the potentially great figures of the past whose talents are lost to us. And they wonder what the future may hold. I'm glad to say that there is optimism alongside the realism. -- This extraordinary Virtualbash takes place here every year on 21 December. It used to be the Ginger Stripes Awards, in honour of my cat Solti, but since his death we've been joined by two new young award-givers, coloured chocolate and silver. -- The choices are entirely personal. -- All you need is a smile and the willingness to join in and/or suspend disbelief, and there's some good stuff to listen to. What? It's the Winter Solstice again? How did that happen? It feels like just the other day we were entering the CyberPoshPlace for Ricki and Cosi's first year as kitten-heirs to our late beloved Solticat's Ginger Stripes Awards. Still, the faster time progresses, the faster we get to enjoy our VirtualVintageBubbly and hug lots of people we can't hug in real life. So please don your CyberGladRags and come on in to the aforesaid venue. Welcome! It's decked out in thousands of fairy-lights, plus tinsel and glittery stuff in our colours, which mix Ricki's chocolatiness with Cosi's silveriness and a tribute to Solti's ginger stripes. Next, a very warm welcome to our special guest stars. Bela Bartók has come to join us tonight, quiet, wise and great-eyed, modest and poised, and he leads the way for a rather surprised collection of characters, gathering by the door and gazing about, wondering how they got here. Three cheers, please, for the great Hungarian violinist Jelly d'Arányi (pronounced Yelly, not Gelly, btw), her sister - also a great violinist - Adila Fachiri, Jelly's former duo partner Dame Myra Hess, and their friend, Professor Donald Francis Tovey. Theirs is a very specific purpose tonight, but I'm not going to tell you what it is (you might have to check back in January to find out). Quiet, please...quiet... thank you. First, a big round of applause for every musician who has touched the hearts of his or her audience this year. You're wonderful. We love you. Thank you for all your inspirational music-making. Now, would the following artists please approach the platform where Ricki and Cosi are ensconced upon their silken cushions. They will let you stroke their chocolate and silver fur and are ready to give you each a very special purr. Icon of the Year: It was Sviatoslav Richter's centenary this year and if there was ever an icon to celebrate it was him. I heard him in the flesh once only, many years ago, in recital at the Royal Festival Hall, on which occasion he played the Schubert G major Sonata and the first chord lasted for what felt like an entire revolution of the moon. This man worked with Prokofiev, managed things in interpreting Mussorgsky and Rachmaninov that few have ever matched, and made recordings that set the standard for generations. Let's take a moment to honour him. Pianist of the Year: The piano recital of 2015 that will stay with me forever was Daniil Trifonov's performance at the Menuhin Festival Gstaad of the complete Liszt Transcendental Etudes. It took place in an atmospheric 15th-century church in Saanen (the next-door village - where Bartók composed his Divertimento) and proved a universe of colour and sonic imagination - as if Daniil was improvising it, yet sounding deceptively easy, natural, unshakeable. It was a privilege to be there. String Player of the Year: This was a tough one, because I've spent a lot of this year editing The Amati Magazine, which means that I've had more good lunches with fantastic violinists, violists and cellists than ever before. But here's da man. He looks flamboyant, yet is sweet and gentle; his virtuosity is dazzling, though delivered with modesty and grace; and incidentally, his incredible band made a Welsh fish and chip shop very happy when we all pitched up in Fishguard for Peter Donohoe's festival on the same day. The ensemble came to London twice to play at the Amati Exhibition and it was a joy and privilege to introduce them. Please welcome the incredible Roby Lakatos. Gratulálok, Roby, and thank you! Conductor of the Year: Susanna Mälkki is a wonderful musician and a powerful personality: straightforward, assertive and able to inspire brilliant results. Her muscular, up-tempo Sibelius 1 the other week had me reaching for my programme to check whether this was a different version of the text, because I was hearing things in it I'd never heard before. Festival of the Year: Wexford Opera Festival is a true one-off. Every autumn this enchanting spot on the south-east coast of Ireland, two or three hours south of Dublin, is transformed into the most interesting venue in the opera world: rare and beautiful operas are performed by exciting young casts with rising directors and genre-expert conductors. This year hearing and seeing Delius's Koanga, Mascagni's Guglielmo Ratcliff and Hérold's Le Pré aux Clercs was a joy and, often, a revelation. If you've never been there, all I can say is: go. And book fast, because it sells out. Artist of the Year: Daniel Barenboim's performance of the Schubert B flat Sonata on his special, bespoke piano at the RFH was probably the most heart-shattering performance I heard in 2015. Barenboim is perhaps the most complete of all our great artists: a visionary, an educator and a philosopher as well as a musician, accepting no division between such roles. Maestro, thank you. Here's a slightly lighter piece of Schubert - with Martha Argerich joining him. Colleagues of the Year: Our composer Roxanna Panufnik, our director Karen Gillingham and the entire team involved in creating our new opera, Silver Birch, for Garsington, where it will be performed in 2017. We now have a cast to die for. We also have a remit to create a work that seeks to reach the widest possible audience, from seasoned critics to opera newbies, featuring professionals, amateurs, children, teenagers, a VJ, Siegfried Sassoon's poetry and matters of life and death. It's a joy working with you all. 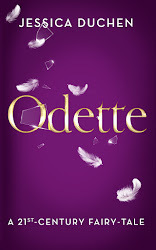 And while I'd always wanted to write an opera libretto, this has been the most fun I have ever had writing anything, ever - because it is in collaboration with you. Please come up to the platform and receive your purrs. Ballet of the Year: Matthew Bourne's The Car Man nearly burned down Islington: the hottest of the hot, with gripping, galvanising storytelling, fabulously danced by a cast who gave more than anybody's all has a right to be. Its star, Jonathan Ollivier, gave his life a few days later, killed on his motorbike in a road accident in Clerkenwell - a huge shock and tragic loss. There is to be a gala to benefit his young family - details here. Stuffed Turkey: There were waaaay too many piano competitions this year, and some were distinctly more interesting than others. (The best I've yet heard, though, is the first prize winner Seong-Jin Cho of the Chopin Competition in Warsaw, whose debut CD I found seriously impressive). Proudest moments: Signing the contract for my opera libretto for Roxanna and Garsington (see 'Colleagues of the Year') - a long-held dream come true. And discovering, after several days giving pre-concert talks at the Istanbul Festival in the gardens of Topkapi Palace, that I had amassed a little fan club. That was great. Weirdest moment: In Pontresina, Switzerland, learning that Richard Strauss wrote 'Beim schlafengehen' (from the Four Last Songs) just over the fence from where I started writing in earnest as a teenager sensing something creative in the air. Biggest sigh of relief: We are not moving house after all! PHEW. 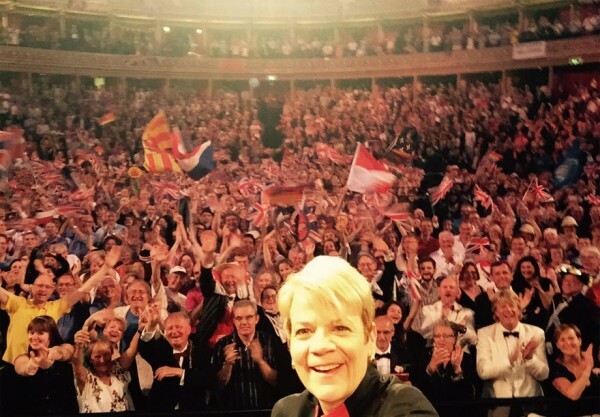 Quote of the Year: "The power of music is to unite us and to bring out the best humanity has to offer"- Marin Alsop, Last Night of the Proms. Wonderful Webmaster of the Year: Horst Kolo, of course. Dearest Horst, I don't know where I'd be without your attentive updates of the article archive and your ever so gentle chasing for my latest news. There's a good one on the way in the new year! Felines of the Year: There have to be two, obviously: Ricki and Cosi, who are beautiful, bright, fluffy Somali cats, now fully grown and too clever by half. As the pet insurance documents delightfully tell us, 'You never know what Richard and Cosima are going to get up to'. Let's spend a moment thinking about what we want to be in 2016. I'm often told that JDCMB is 'the voice of reason' in our little corner of this crazy world - and I hope that's the case and intend it should continue to be so. Too often, the wealth of culture, invention, wisdom and delight that centuries of accomplished art music has built up seemingly doesn't count for a hill of beans any more. Yet music is one of the true forces at work for spiritual, social, mental and corporeal good - and the case has been made to prove this again and again and again. Still it must be restated often, because people who haven't seen its power for themselves always need to be convinced. Once you've witnessed it, you know it's true. Please join me to love our music, explore the joy it brings us, celebrate it and uphold its marvels in the face of whatever life throws at it, and us. Let's keep our heads, our sense of perspective, our passion and our idealism where our art is concerned. A remarkable book landed on my desk recently - and if anyone is looking for a rapid Christmas present for a music lover, I can't recommend it highly enough. Edited by Michael Church - for whom it has clearly been a lengthy task and an absolute labour of love - it is entitled The Other Classical Musics: Fifteen Great Traditions. Here western classical music emerges as just one of many: no more and no less than one possible option, a richly rewarding and individualistic approach to the art of sound, manifesting itself through the philosophies and social ecosystems of western Europe. This is not, however, world music for dummies. Every topic is treated with deep, considered and well-expressed exploration of history, society and musical analysis. It will suit academics and the general, intelligent reader alike. Western musicians (to generalise, of course) can be broadly under-aware of other great worldwide traditions of music - maybe because we're so busy perfecting our own that it can be difficult to find the way out of our tunnel and, indeed, to know where to start. As a student I used to go with my violinist duo partner (who lived in Kingsbury) to Brent Town Hall to hear Indian classical music. Often we'd be among a tiny sprinkling of European faces in the packed-out audience. And my goodness, we heard some marvels - not least, we were transfixed by Zakir Hussain, who was about 21 at the time. We also went rushing to hear the Peking Opera whenever they performed in London, with their breathtaking acrobatics and the acidic magic of their narrative music. I also spent a week at the Dartington International Summer School interspersing piano masterclasses with doing the gamelan class every morning; the more you are drawn into that collaborative, clangorous, vibrant flow, the odder distant Mozart would sound when you walked back past the other studios afterwards. Yes, we were seduced by apparent exoticism, but also we became aware of just how much we didn't know and weren't otherwise learning. My duo partner ended up becoming an ethnomusicologist and finally abandoned his violin for the Chinese erhu. If only we'd had this book to help us in, I might have considered following his lead. On one level this weighty, beautifully produced and often almost surprisingly readable volume is a history of world societies seen through their musical traditions. On another, it's an extremely useful introduction to, and exploration of, numerous traditions - most centuries long, some longer still. Even if we are mesmerised by the sound of music from other traditions, we might derive still more pleasure and interest from it if we know the context it springs from and how, technically, it works. Given the vital nature of the influence on the great western composers of traditions from, for example, the Far East, India and Africa, this exploration can bring much insight to those steeped in what we think of as classical music. Debussy and Messiaen might have been the first to applaud; Ligeti, who was influenced by the metric principals of Congolese drumming, would do so too. As Church tells us, "This is not a comparative study, but it does allow comparisons to be drawn." 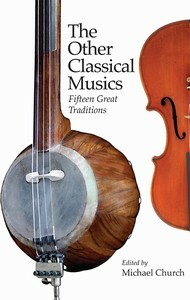 Much of the book is devoted to the music of the far and near east, with two chapters apiece for China and India; the Mediterranean offers rich pickings with a fascinating exploration of the Andalusian music of the western Med area and one ranging through a Turkey that 18th-century Vienna might find it hard to recognise. The aural traditions of the west African regions that comprise Mande Jaliyaa are unpicked and beautifully evoked by Roderic Knight; Church and Terry E Miller whirl us through the contexts, splendours and technical bedazzlement of Chinese Opera; and the regions of south-east Asia are described in the Javanese chapter with an analysis of the local gamelan (Neil Sorrel). North America, meanwhile, is represented by a chapter on jazz. That is just a taster of a sackful of riches. What this book can do is ultimately to offer a deeper, richer understanding of the nature of music itself and its significance to human beings the world over. As such, it could be transformative. The Other Classical Musics is published by the Boydell Press, £25 hardback. This extraordinary piece of music is going to dominate my next six months or so, so I'd love you to get to know it a little now. I'll be posting a lot about it for reasons that will become apparent. Please note that the second movement's main theme shares its derivation with that of the Geistervariationen, to which we listened here the other week. This wonderful performance is by Christian Tetzlaff, with the Frankfurt Radio Orchestra conducted by Paavo Järvi. So the feasibility study for the new concert hall - The Centre for Music - has finally surfaced, a little later than planned. It's being greeted, generally speaking, as if it's to be the next London Olympics. "A global beacon," declares The Standard... Nicholas Hytner (he who said that building the Southbank Centre extension would spoil the view from his National Theatre) compares it to Tate Modern, which he says enlarged audiences for other visual arts rather than taking them away. This should, he says, be "a Tate Modern for music". Having writtten more times than I can count that it's a disgrace London has no world class concert hall, on one level there's nothing I'd like better than to see it materialise. But there are an awful lot of questions to ask first. 1. Who's going to do the acoustics? If £278m is to be spent on this thing, it does have to be world class. World class has to mean putting its purpose first, its functionality as a hall, ahead of architectural concerns. Please, George, can we have Mr Toyota? Musicians in the know tell me that his halls are the finest in the world. 2. What are we going to put in it, besides the LSO? We have a name in this country for building boxes and then having trouble with content. It took a long time for the Millennium Dome to find its purpose in life. Waterloo Station, the busiest in the country, has a row of platforms that have sat disused since Eurostar shifted to St Pancras. Yes, just sitting there. And so forth. "The LSO" is not answer enough to this question: no orchestra performs every night of the week, and while visiting recitalists and international orchestras will welcome the venue, can they fill it every remaining evening? Dark nights would make it difficult to stack up the sums of money involved. 3. Assuming the £278m is found - and we can probably add a few extra £ms to that, as few projects are ever realised for the planned amount - that's one matter. The money for actually running the place day to day, year after year, will come from a different budget. That's where ACE competition is likely to kick in. If extra filthy lucre isn't forthcoming, this place is going to be competing for the same, dwindling pot of cash as the Southbank, the Barbican, dear ENO and the rest of it. This project would appear to be the darling of all concerned in creating it. What happens to everyone else? 4. Will London in the end be culturally better off - or worse? Will this be an excuse to axe classical music at the Southbank, the Barbican and one of this 10m-people city's all-of-two (2) opera houses? Is the price of running the new hall and its Orchestra Rattle going to be the lifeblood of the Philharmonia, the LPO, the RPO, the OAE and more? If so, that price is too high and it will leave London with worse musical provision, not better. 5. Where is Sir Simon going to take his shower? (Or his bath. Apparently he had a bath installed in his dressing room at Symphony Hall, Birmingham, during his CBSO years.) There's a good dose of hot air around: "There will be no 'formal' front and back of house areas dividing the musicians from the audience," the Standard reports. So, er, how do we think performers work? They need to change, wash, do their hair, rest, eat, be recorded and, above all, practise. The backstage facilities in London's current delights are currently woeful - when one big visiting orchestra was in town not long ago we found them changing in the corridors because they'd arrived with their concert clothes in their usual wardrobe trunks and there wasn't room for them all in the school-gym style dressing rooms. There's no space for anyone to rest between rehearsal and concert, let alone practise. You'll find, if you visit a "state-of-the-art" hall or a great historical one in Germany or Austria or Moscow, that the soloist and conductor have roomy rooms to themselves, usually with a grand piano. Most halls also have a good staff canteen, rather than making people who work there queue for hours at fancy sandwich bars in the foyer. The backstage facilities at this new place need to be better, not non-existent. This clause raises a question about what planet the planners are living on. 6. Does that piece of hot air indicate more of the same? 7. When are we going to have proper musical education in this country? Space and inspiration for education projects is very nice. All arts organisations need education departments these days (not least because they can thus access funding to run them). But isn't it time to take a long, hard look at what they achieve long-term? I do know people who have been inspired to discover their musical vocation by visiting orchestra education projects - the composer Tansy Davies is a case in point. But essentially, education departments were invented back in the 1980s as a sticking plaster to hide the wound left by the axing of peripatetic instrumental teachers throughout the school system. Today the battle to include music as a core subject in schools is raging more than ever before. America has apparently elected to do it. As yet, we have not - despite the case having been made again and again and again, and thoroughly proven. The problem is that music needs to be taught consistently, week after week, by dedicated, qualified teachers, and practised daily by disciplined young people who want to learn to play or compose or both. Otherwise they can't become musicians. Dangling a great orchestra in front of a child for a day and taking some photos is no substitute and it never was. It may look wonderful - but what's left for the children after the orchestra goes home, unless they can be provided with instruments to play and teachers to show them how, regularly and consistently? Learning music is like taking care of your teeth every day. A once-a-year visit from someone's education and outreach department is like going to the dentist once a year without flossing or brushing in between. 9. How come funds go to buildings, but not the people who produce the art within them? Our performing artists are not paid adequately. They are subsidising the art themselves by accepting levels in some cases a quarter of those afforded for artists elsewhere. Musicians are struggling - most orchestral players can't afford to live in London any more - and if we think they have it bad, just try dancers, who have it even worse. As for extra individuals such as guest speakers, just the other day I was asked to do something at a distinguished concert venue which sounded fun, but when I asked what the fee would be I was told: "This event does not have a budget. We are looking for volunteer's who we believe have a lot to offer people...". (That's pasted in from the email, apostrophe and all.) I won't be the only one who faces this situation. How come a top venue is so starved of funds that it must refuse to pay its project participants even a tenner? Before we spend hundreds of millions of pounds on a new venue, we should ensure that its content is going to be provided for, and at levels that match those paid in comparable places in other countries. 10. Please, can we just get our priorities right? Yes, we want a great hall. Yes, London deserves one. But a civilised society also deserves the arts to be supported at every level, for every age, because if you don't nurture children with education in the arts, and if you don't present adults who have trained for an artistic profession since they were five years old the opportunity to make a decent living at it, and if you don't make the arts a daily part of life in a way that will help maintain the audience, then who will be left here to perform and listen to music in that snazzy new hall in any case? The BBC's decision not to renew the contract of the BBC Symphony Chorus's conductor, Stephen Jackson, has sparked much upset and anger these past days. Spearheaded by singer Harold Raitt, who runs a social enterprise for schools, a letter has been written to BBC director general Lord Hall, objecting to the decision and expressing considerable discontent with how the chorus has been treated in this matter. The film director Tony Palmer has added his weight to the issue, contributing strong words to a press release issued by Raitt, and he has sent me the full letter. • some music-lovers who are also concerned and appalled. You are, no doubt, aware of the immense discontent at the BBC Symphony Chorus, especially now that it has been covered in Private Eye. However, you may not be aware of the way in which the actions of the BBC Symphony Orchestra General Management, and the overall management of BBC Performing Groups, have been seriously damaging both the standing of the BBC, and the potential future of one its most important assets for a considerable period. The pictured advert for “BBC Performing Groups” was a major affront to the unpaid professionals in the BBC Symphony Chorus, as well as their colleagues in the BBC National Chorus of Wales. Why on earth did the BBC consider it has only one singing group? Are the BBC Singers only world-class or worthwhile or valuable because they are paid? Is a group of unpaid professionals such as the BBCSC or BBCNCW not as valued, despite the lists of award-winning recordings to their names, and their high profile at national events such as the Proms? Despite requests, no retraction of, or public apology for this insult was made by the BBCSO General Management or by BBC Performing Groups. The dismissal of Stephen Jackson after 26 years’ dedicated service, without any prior consultation with the BBCSC and conducted in a way as to try to prevent the Chorus even saying a proper goodbye to him, is an affront not just to the BBCSC, but to the entire amateur choral scene in the UK. Its members subsidise classical music in the UK to the tune of millions of pounds annually. The cost of a chorus of 100+ at MU minimum rates for just a single concert would be a large five-figure sum, or a six-figure sum for much of the larger and more rehearsal-intensive rep. Yet the attitude of the BBCSO General Management towards the BBCSC has been one of a disengaged and supercilious employer. But, in the case of unpaid professionals, it is us who really hold the keys; we pay our travel expenses to rehearsals, we donate our time, expertise and (in many cases) years of training and singing lessons to you free of charge, we learn difficult rep and present it to audiences flawlessly. The very least that can be expected is that we are treated as partners and stakeholders, rather than as disposable labour who need not be considered, consulted, acknowledged or even – on occasion – properly thanked. None of us can think of a single other Symphony Chorus in the UK where the singers (either en masse, or via their representatives on committees) would not be thoroughly consulted on a leadership change of this magnitude. The vast majority of the signatories to this letter are not currently and have never been members of the BBCSC. However, many of us are members of volunteer choruses in London or around the UK. Some of us chose to sing with other choruses because of our geographic location, rehearsal days or because of different performing opportunities. However, we all have immense respect for Stephen Jackson, and for the choice of our colleagues to sing with and under him. Many of us are astonished that the BBCSC has not decided to go on strike until Jackson is reinstated. However, we recognise this not as tacit support for the BBCSO management, but as a sign of the love for music and its audiences that drives all such performers to do what they are so committed to. You should be aware of how – despite ‘perks’ such as getting to star annually on the Last Night of The Proms – the BBCSC’s capacity to attract new volunteer unpaid professionals to sing in its ranks has been considerably damaged by these ongoing slights. Those of us who are ‘amateurs’ would be much harder pressed to consider singing with the BBCSC while the current General Management remains in place and/or remains so unashamedly unapologetic. Furthermore, as licence payers, we are appalled at the callous disregard for the integrity of an asset which, in any other country, would be valued in millions of dollars or Euros, and which remains, given its budget of £0 for its unpaid professionals’ salaries, the envy of the world. For the moment. Responding with a statement, quoted in Classical Music Magazine, BBC Radio 3 said: "We regularly appraise the freelance contractual arrangements we have across BBC Radio 3 and the performing groups and took the decision, in this instance, not to renew Stephen Jackson’s contract. We’d like to thank him for his service over the years and wish him well for the future...Freelance musician contracts are rightly confidential arrangements between the individual and the BBC. We’re satisfied that this matter is being handled in a professional and responsible manner and are liaising with the Chorus whenever possible." Many thanks to Tasmin for sending this to me to run in full. Good afternoon. For those of you who don't know me, I'm Tasmin Little and I have worked as an international solo concert violinist for nearly 30 years. I've performed in every continent of the world, I have received a Classic Brit Award, a Gramophone Award and a Gold Badge Award; I am an Ambassador for The Prince’s Foundation for Children and the Arts, I have 4 Honorary degrees, a Fellowship of the Guildhall School of Music and Drama, and an OBE for Services to Music. A couple of weeks ago, I gave my 1500th professional performance. I spoke here in 2013 to a committee of MPs on the subject of music education - and it's something I feel very strongly about, because I wouldn't be here addressing you now were it not for the fact that, when I was growing up in the early 1970's, my State Primary School in London employed a full-time violin teacher. I did not come from a musical background, but was lucky enough to have a teacher of quality who was able to recognise my talent. Any state primary school child should be able to aspire to my level of achievement but I do not believe they currently stand an equal chance of doing so. During the 1980's, music education in this country took a nose dive and we are still recovering from an extended period when it was very far down the list of priorities. A whole generation missed out, not only on opportunities to enjoy playing and listening to music themselves, but, as many of them are now the teachers and parents of today, on the knowledge of what it can bring to their own children. I believe that many people take for granted the importance of music - and fail to appreciate that it is an integral part of each and every person's life, whether they realise it or not. This aural diet of dry husks would make each and every one of us yearn for the vast and varied panoply of music to nourish our ears, enrich our souls, and provide joy as well as comfort. This is taking it to extremes as, in the context of most societies, there will always be music. Indeed the banning of music under rule of The Taliban and ISIS demonstrates how barren life would be without it. However, we are in danger in this country of putting music so far down the educational agenda that we risk not only diminishing the superb quality and status of those first class musicians who we have enjoyed up until now, but also losing a huge part of our cultural heritage. We're all here because we believe in the importance of music in our lives and in providing high-quality music education in this country. But there really is a great deal more to be done in order to ensure that all children are receiving the best opportunities possible, and that we maintain the highest standards for our future generations. Music is worthwhile in its own right, but I'd like to explain why music education provides so much more than the obvious. I'm hoping that you've all been given a list of 14 points which fill in more detail than I have time to talk about now. Please take this list away with you and peruse the information, as it is based on results of research taken from all over the world. It improves reading and verbal skills, and helps children get good marks in exams. It raises IQ, encourages listening and helps children learn languages more quickly. It strengthens the motor cortex and improves working memory and long-term memory for visual stimuli. It helps people to manage anxiety, enhances self-confidence, self-esteem and social and personal skills. It slows the effects of ageing! That's got to be good news! It also encourages creativity – no surprises there. This next one is a particular favourite as I have experienced this a great deal over the years... Learning a musical instrument encourages team building and, what's even better is, that these effects are not only felt by the pupils, but by the schools, and far into the wider community. At the ground-breaking primary school in east London, Gallions, every child learns a string instrument – as a result, there are no discipline problems, no absenteeism from the staff, and no truancy, even though this school is situated in an area of social deprivation. Finally, music also improves mathematical and spatial-temporal reasoning. When you consider that these skills are highly prized by the government and are vital in a multitude of potential careers including maths, engineering, architecture, gaming and especially working with computers, it's fair to say that young musicians can pretty much succeed in any field they decide to pursue. Which brings me to my next point – how music is perceived within the education sector. I spoke recently to the Head teacher at a nearby Grammar School and asked him why music education seems permanently to be at risk of being downgraded in the curriculum. His answer was: because it is not seen as a “facilitating subject”. This really makes no sense at all, based on all the research and hard evidence of what music can provide. And, crucially, what can we do about it? I think the first thing that needs to happen is that we must urgently invest in good teacher training. Sadly there are still many primary school teachers who are terrified to teach music because they themselves have not been taught the necessary skills to give their best – this situation is vastly unfair both on pupils and teachers. In addition, I do believe that there are some Head Teachers who don't understand what music can bring to their school - and I had a direct experience of this myself a couple of years ago, at a time when I was visiting a great many schools during the course of an academic year at the invitation of a County Council. Most schools were genuinely thrilled to have me there – however one primary school Head Teacher made it clear that my visit was a nuisance and interfered with important school routine. It was only after being incessantly pestered by the children whose classes I wasn't visiting, that she came in to see what I was up to - and finally asked me to play in the end-of-day assembly. To her credit, she was the first to start the rapturous clapping at the end, and her parting words to me were along the lines: “I'm sorry, I know I was unfriendly when you arrived but I've had OFSTED here all week and it's been so stressful. I thought your visit was the last thing I needed. But, in reality, it was the very thing that we all needed - the highlight of the whole week." 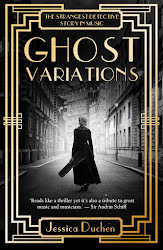 Whilst my story has a happy ending, there is clearly so much more work that needs to be done to ensure that teachers do not feel that music is a chore, and a box to be ticked. I have visited hundreds of schools over the past 30 years and played to literally thousands of children of all ages, both here, and abroad in countries such as Zimbabwe and China, so I know what can happen when music is brought into the classroom and how the experience fuels the children's desire to make music themselves. So I've been thinking about how to facilitate the stimulus of live music in schools, so that it becomes a regular event in schools. I've had an idea. What if a programme were developed within music colleges and universities whereby music students are given some training to go into schools to play and demonstrate their instruments, as well as chat to, the children – this would have a number of benefits: the primary school children would have access to high-quality music; it would enable young performers to gain important performance experience; it would give teachers ideas to build on for future classroom lessons and help them feel more comfortable with the subject; live music is very good for school morale; for those many musicians whose career will take them into teaching, the experience would be invaluable; and for those intending a career in performance, it would help equip them with the necessary skills now needed to successfully interact with audiences of all ages, and promote one's career. Historically, our education system has been the envy of the world – and currently, thousands of pupils come from abroad to enjoy what our education can provide. I don't think this is because we teach English, maths and science better than any other country - it's because we are one of the few countries that truly provides a breadth and range of curriculum essential to give each individual the maximum chance to find and develop all their talents. We have been a nation of innovators, precisely because of this - and historically, we have always valued that most important quality, creativity. And when we think of all the people in the history of this country, who have made a difference on both an international and a domestic stage, the vast proportion were intensely creative. They were people who dared to challenge preconceived ideas, ignore the rules, and come up with radical innovations, both technological and artistic. However, if the reasons I have provided thus far are not convincing enough, then let's consider the impact of music as a financial benefit to our economy. UK Music has published an annual economic survey of music’s vast contribution to the UK economy. In 2014 the music industry contributed £4.1bn to the economy and the sector once again outperformed the rest of the British economy, with growth of 5% year-on-year; the industry provides 117,000 full time jobs; and music exports contributed £2.1bn in revenue . So, although many people assume that our economic success depends on commerce alone, this is clearly not the case. - but if this is the case and the Arts truly ARE valued in this way, then it is imperative that this is reflected and strengthened by their high visibility in the Ebacc curriculum. We will cease to be brilliant at these subjects if we do not nurture music and the Arts from the very start of the education system, and keep it high on the agenda right through secondary education. In fact, I believe we've already begun to fall behind other European countries, as well as America, Scandinavia, China and the Asian Continent. In a recent leading international competition - one which has often been able to showcase outstanding young UK musicians in the past - there were no UK entrants of a high enough quality to enter even the competition's initial rounds, let alone get to the Finals and gain any prizes.” This is doubly depressing because it needn't be the case. In October of 2013, neuroscientist Thomas Südhof was awarded the Nobel Prize in Physiology for his work in explaining the mechanisms of the presynaptic neuron. Interestingly, he attributed most of his success to the qualities he learned from his early training in classical music, and the value of disciplined study, or repetitive learning, for creativity. Music is a discipline - it requires patience, hard work, flexibility, understanding, teamwork, good communication skills and the ability to maintain concentration and really listen. Wouldn't it be wonderful if all young people of today were able to truly learn these qualities and take them into their future? Whoever neglects the arts when he is young has lost the past and is dead to the future. Several studies have found strong links between pitch processing and language processing abilities. Researchers out of Northwestern University found that five skills underlie language acquisition: “phonological awareness, speech-in-noise perception, rhythm perception, auditory working memory and the ability to learn sound patterns.” Through reviewing a series of longitudinal studies, they discovered that each these skills is exercised and strengthened by music lessons. Children randomly assigned to music training alongside reading training performed much better than those who received other forms of non-musical stimulation, such as painting or other visual arts. Music is deeply mathematical in nature. Mathematical relationships determine intervals in scales, the arrangement of keys and the subdivisions of rhythm. It makes sense then that children who receive high-quality music training also tend to score higher in maths. This is because of the improved abstract spatial-temporal skills young musicians gain. According to a feature written for PBS Education, these skills are vital for solving the multistep problems that occur in “architecture, engineering, maths, art, gaming and especially working with computers.” With these gains, and those in verbal and reading abilities, young musicians can pretty much help themselves succeed in any field they decide to pursue. In a 2007 study, Christopher Johnson, a professor of music education and music therapy at the University of Kansas, found that “elementary schools with superior music education programs scored around 22% higher in English and 20% higher in maths scores on standardized tests compared to schools with low-quality music programs.” A 2013 study out of Canada found the same. Every year that scores were measured, the mean grades of the students who chose music were higher than those who chose other extracurriculars. While neither of these studies can necessarily prove causality, both do point out a strong correlative connection. Surprisingly, though music is primarily an emotional art form, music training actually provides bigger gains in academic IQ than emotional IQ. Numerous studies have found that musicians generally boast higher IQs than non-musicians. Musical training makes people far more sensitive listeners, which can help tremendously as people age. Musicians who keep up with their instrument enjoy a much slower decline in “peripheral hearing.” They can avoid what scientists refer to as the “cocktail party problem” in which older people have trouble isolating specific voices (or musical tones) from a noisy background. But beyond just auditory processing, musical training can also help delay cognitive decline associated with aging. Some of the most promising research positions music as an effective way to stave off dementia. Studies out of Emory University find that even if musicians stop playing as they age, the neurological restructuring that occurred when they were children helps them perform better on “object-naming, visuospatial memory and rapid mental processing and flexibility” tests than others who never played. The study authors add, though, that musicians had to play for at least 10 years to enjoy these effects. So this adds even more weight to the argument in favour of starting children early and continuing with music lessons during high school. All musical instruments require high levels of finger dexterity and accuracy. The training works out the motor cortex to an incredible extent, and the benefits can apply to a wide range of non-musical skills. Research published in the Journal of Neuroscience in 2013 found that children who start learning to play before the age of 7 perform far better on non-musical movement tasks. Exposure at a young age builds connectivity in the corpus callosum, which provides a strong foundation upon which later movement training can build. Playing music puts a high level of demand on one’s working memory (or short-term memory). And it seems the more one practices their instrument, the stronger their working memory becomes. A 2013 study found that musical practice has a positive association with participants’ working memory capacity, their processing speed and their reasoning abilities. Writing for Psychology Today, William R. Klemm claims that musicians’ memory abilities should spread into all non-musical verbal realms, helping them remember more content from speeches and lectures. Good news if you want a career in politics. Music training can also affect long-term memory, especially in the visual realm. Scientists at the University of Texas at Arlington reported last year that classically trained musicians who have been playing more than 15 years score higher on pictorial long-term memory tests. This “heightened visual sensitivity” likely comes from parsing complex musical scores. Several studies have shown how music can enhance children’s self-confidence and self-esteem. A 2004 study split a sample of 117 fourth graders from a Montreal public school. One group received weekly piano instruction for three years while the control received no formal instructions. Those who played weekly scored significantly higheron self-esteem tests than those who did not. High levels of self-esteem can help childrengrow and develop in a vast number of academic and non-academic realms. Creativity is notoriously difficult to measure scientifically. But most sources hold that music training enhances creativity “particularly when the musical activity itself is creative (for instance, improvisation).” According to Education Week, Ana Pinho, a neuroscientist at the Karolinska Institute in Stockholm, found that musicians with “longer experience in improvising music had better and more targeted activity in the regions of the brain associated with creativity.” Music training also enhances communication between the right and left hemispheres of the brain. And studies show musicians perform far better on divergent thinking tests, coming up with greater numbers of novel, unexpected ways to combine new information. 14. It encourages team building and these effects are not only felt by the pupils but by the schools and far in to the wider community. But most of all: It is musical, and important in its own right as its own subject, its own discipline and its own artistic, intellectual, academic, professional career path. Who to turn to in "maturity"?